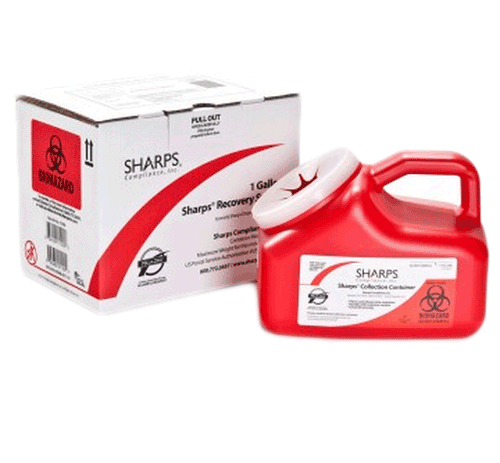 Sharps Waste Disposal By Mail BUY 1 Gallon Sharps Disposal, Sharps Compliance, Sharps Disposal By Mail, 11000-018, 11000, Sharp Waste Disposal. 1-Gallon Sharps Recovery System is a complete mail back disposal system that simplifies the management of bio hazardous waste. Available for purchase individually or in a case of 18. The 1-gallon container is ideal for medical professional offices that produce larger numbers of sharps such as veterinarians, medical, dental, pharmacies, home-users, schools, and other businesses that need disposal of sharps and small quantities of medical waste. The Sharps Recovery System is approved for returns in all 50 states and US territories by USPS. Each system includes a red OSHA-compliant sharps collection container, return shipping box, tracking manifest, instructions for use, and pre-paid return shipping. When ready for return, simply place the red container in the pre-paid shipping return box and return to Sharps. Each container comes with accompanying shipping boxes. Container has a balanced handle and wide base, making it excellent for transport. Containers can also be placed on a counter or mounted. Treatment of waste includes the Sharps patented Waste Conversion Process. One purchase price with no return postage fees or additional fees. Maximum Returnable Weight Capacity per container: 10 lbs.